Action Wildlife Removal is a Brampton based company, providing professional and reliable wildlife removal and control services. We specialize in humane raccoon removal, skunk removal and squirrel control services. We serve our professional and reliable wildlife control solutions to home owners and commercial clients. Your safety is our top most priority and we strive to provide a healthy environment for you and your family. Don’t let nuisance animals wreak havoc on your property. Contact our wildlife removal services. Evaluate and inspect your property to identify the animal’s point of entry. Locate the animal and its living space. Determine the damages caused by the animal to your property. Eliminate the animals in a safe and humane manner and then relocate them to a safe habitat. Clean and disinfect affected area to deodorize or remove any biohazards. Undertake the necessary repairs and prevent future re-entry. Raccoons can cause a lot of damage to your property. They can gnaw on electrical wires, wood and almost any stored item. Moreover, raccoons carry various diseases and parasites that can have a negative impact on humans and pets. In order to deal with these dangerous animals, you require experienced professionals. Call our trained and qualified experts to prevent raccoons from your premises. Skunks are black and white mammals that have the ability to spray a stinky fluid in self-defense. They are mostly found living under a shed or deck, or digging small holes in the yard. Our technicians are skilled in dealing with these mammals and preventing them from coming back. We will capture and relocate skunks to a safe area. Are squirrels causing damage to your home’s wiring, insulation, soffits and roof? If yes, call Action Wildlife Removal in Brampton, as we have the right solutions and equipment required for removing these little critters. Our technicians are expert in identifying the entry points and evict them quickly before any further damage occurs. 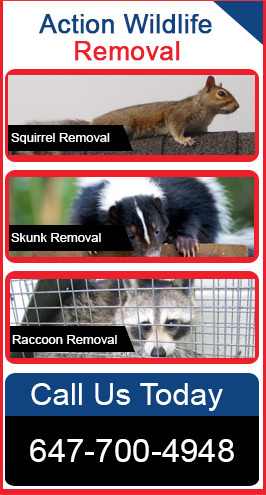 Please call our expert wildlife removal services in Brampton to handle your wildlife issues. Our full services from eviction to remediation will help you restore your property. Call our experts to schedule a squirrel removal service in Brampton.